Papilio is an exclusive 3 bedroom Premier Villa on the island of Favignana, only 20 minutes hydrofoil away from Trapani, Sicily, Italy. This modern, new villa has large private grounds amid lush Mediterranean vegetation. Papilio is situated in an extraordinary and privileged natural location just a few minutes away from the famous Cala Azzurra and Cala Rossa, the two most beautiful bays in the whole island. The accommodation, designed according to ecological criteria and with a very low environmental impact, has been built fully respecting the natural surroundings and blending in an harmonious way. Following the typical local architecture, colours and distinctive island's traits, the design confers a refined and exclusive atmosphere to the villa. The accommodation is divided into 2 adjacent units sitting on impressive grounds. Large terraces, a well-groomed garden and a small but beautiful swimming pool with sun loungers and shaded area invite guests to spend relaxed hours soaking up the sun. With its exceptionally high standard furniture and fittings, Papilio offers stylish interiors and ultimate luxury and privacy. 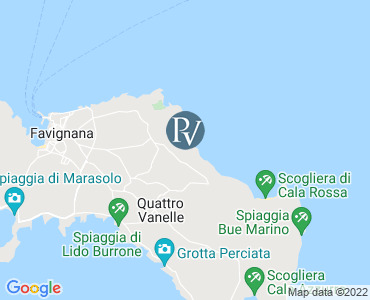 The great connections and close proximity to mainland Sicily make Favignana an easy location to sightsee the both the great sites close to Trapani in Western Sicily and the other beautiful islands in the Egadi Archipelago (Marettimo and Levanzo). All prices are per week for the accommodation only. Arrival is between 4pm and 8pm (Saturday) and departure is between 8am and 10am (the following Saturday). Please note that availability shown is subject to confirmation - please call our reservations team.